Historically barn raises reflected the collective action of neighbors gathering to support each other by raising a barn for shelter, safety & warmth. This fundraising event is the embodiment of that compassion of offering a hand up to neighbors in need. Join us in a night of great food and good company, and a collaborative effort to Raise The Barn! Visit www.yamhillcap.org/events to learn more and purchase tickets! The Point In Time Homeless Count is a single day in January dedicated to conducting surveys with persons experiencing homelessness--- who are couch-surfing/double-up, sleeping in vehicles, on the streets, in shelters, or sleeping in other places not meant for habitation. The results are used for local planning purposes and to secure additional funding for housing and homeless services. There are lots of opportunities to get involved throughout the day. Help us make the 2019 Homeless Count a success! Food Barrel available at this location for Food Bank donations. Bring in 10 cans to donate and receive the 10% Off Black Friday Special for any event (valid until Cyber Monday). Buy a hero, Be a Hero. Every online order or order placed via Subway’s mobile app - donate the equivalent of one meal to Feeding America! Barrel available for Food Bank donations at this location. Barrel available for Food Bank Donations. Be a Hunger Champion! Purchase Turkey Bucks in your local Safeway and Albertsons to support families in need to have a Thanksgiving and Christmas dinner! A month where people all over America stand together with Feeding America and the nationwide network of food banks to fight hunger. It’s a month to spread the word and take action on the hunger crisis, and dedicate ourselves to a solution. Will you join in? Safeway Albertsons is again holding a "Bag Summer Hunger" food drive. The drive will take place at Safeway AND Albertsons stores throughout Oregon and Clark County, Washington. Customers will be able to "purchase" a virtual bag of food for either $5 or $10. As part of the Kroger/Fred Meyer's commitment toward Zero Hunger | Zero Waste, they are implementing a new year round register donation program called Zero Hunger Round Up. Cashiers will ask customers if they would like to round up their total to the nearest dollar as a donation to local food banks. 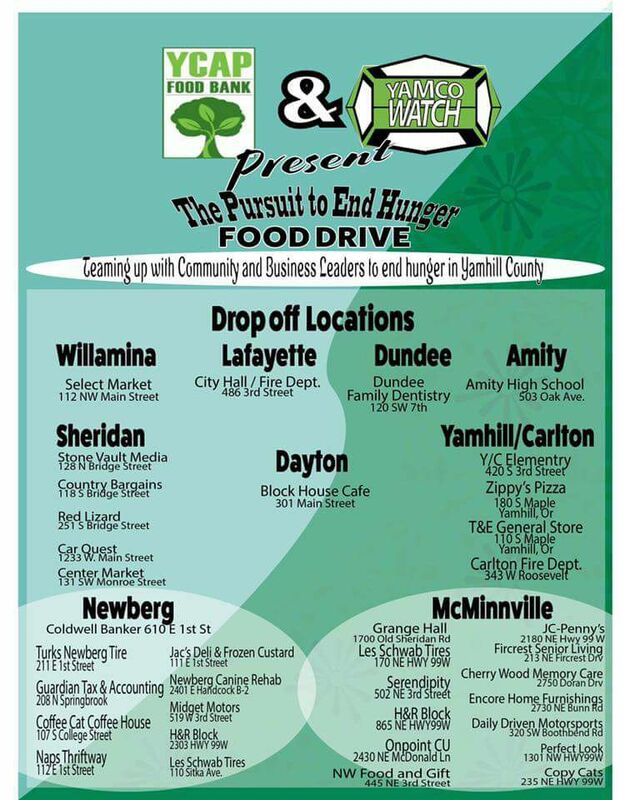 A month-long Food Drive throughout Yamhill County. The goal: with your help - collect at least 38000 pounds of food. More details to come soon including drop off location.